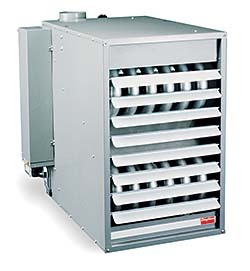 Gas Unit Heater features 120V, direct spark in-shot burner ignition, tubular heat exchanger, and power venting. With 83 percent thermal efficiency and a 2-point suspension propeller, this heater meets ETL standards. Models available with BtuH outputs from 121,500 up to 324,000, and airflows from 2,400 cfm to 5,800 cfm.